The Horizon 2020 EU funded project, IN-PREP, is taking action in preparedness of crises with a system that enables response agencies to train, plan and collaborate together. Scientists, engineers and crisis managers across Europe have developed a new Mixed Reality training platform for collaborative training in joint crisis operations. 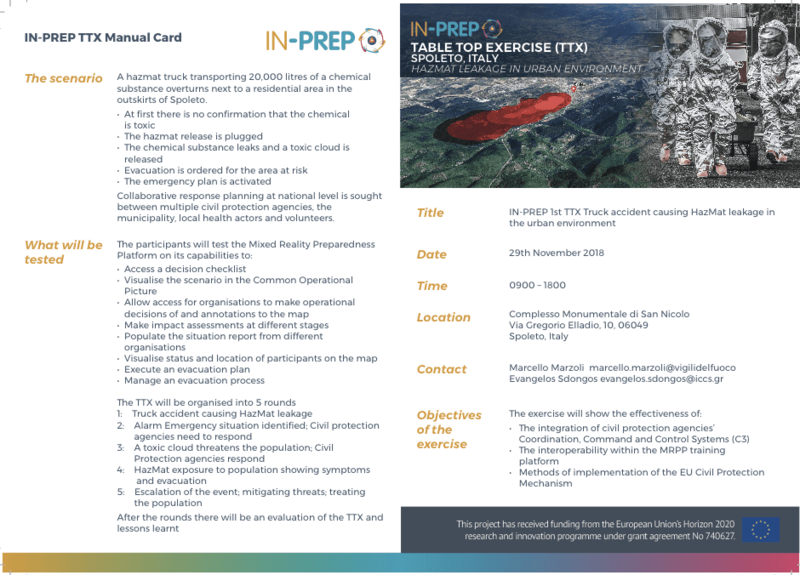 For the first time, with the cooperation of the municipality of Spoleto, IN-PREP will test their Mixed Reality Preparedness Platform (MRPP) with a disaster training table top exercise. The Italian hilltop town sits on the foothills of the Apennines, close to the area of Abruzzo where avalanches and 3 emergencies occurred in 2017. The exercise, based on the scenario of a hazmat accident, will train civil protection responders to hone their skills for an effective coordinated response. The cascading crisis will be pitted against civil protection responders and the prototype training platform. “As the crisis scenarios change unexpectedly on the MRPP platform, the coordination and speed of the response team to allocate resources, evacuate people and assess risks will be tested. Communication between different agencies and their systems (known as interoperability) and the Command and Control room will be monitored. Drones, sensors and satellite images will also be used to enhance realism of the training sessions and provide an overview of the crisis. Our vision is that the IN-PREP tools will ultimately lead to better understanding of preparedness levels and enhancement of collaborative response plans,” said Evangelos Sdongos project manager of IN-PREP. Currently, many civil protection operating systems are decentralised. Information exchange between organisations is limited as they have different technology, protocols and security layers. Interagency collaborative exercises involving the entire chain of command are costly and labour intensive, requiring a high trainer to trainee ratio. During a major crisis that cascades rapidly, affecting thousands of people in diverse political areas, different organisations need to communicate with each other easily and make decisions quickly in order to save people’s lives. The IN-PREP team have developed a training system that targets interoperability. Using the platform, different responder agencies can plan, train and communicate with each other seamlessly. The training platform will help responders to have a more efficient approach that will save precious seconds when responding to crisis events enabling more lives to be saved. “Crises in this era require response teams to be both efficient and effective. They need to have increased situational awareness, receive and share rich information while coordinating their efforts. IN-PREP will provide the necessary tools to help response teams address these goals, subsequently increasing the quality of humanitarian aid” said Dr Angelos Amditis IN-PREP coordinator. The growth of disaster risk means that there is a need to strengthen disaster preparedness for response. Since its launch in 2001, the EU Civil Protection Mechanism received close to 300 requests for assistance and intervened in devastating disasters in Haiti (2010), Japan (2011), the Philippines (2013), the Ebola outbreak (2014), and was actively used in responding to the forest and wild fire emergencies in Greece , Sweden and Latvia this year. IN-PREP will test effective ways to implement the mechanism through their joint exercises.